I love your goals!! For me, I'm still chasing a sub-2 half, and like you, really would love to qualify for Boston. I haven't told my coach this yet but....I want to do it in the fall of 2018. Eek! The thing with big scary goals is that they give you something to work toward! I just like to break them into smaller milestones. For RnR DC, I'd love to break 2 hours, but my current PR is 2:10, so I'm going for 2:05 or under. I technically hit a PR in the back half of my marathon last month...Bit I don't count that ;). I'd like to get close to 4 hours this fall at the marathon. Progress towards my goals!!! I like that you threw in a non-running goal to work towards this year. I had a yoga goal of getting my palms flat on the floor in forward fold, which was something I could easily do when I was younger--but in November I discovered that I couldn't even touch the floor. After 5-6 weeks of semi-regular practice, I managed it last night. Now I'm trying to figure out what my next yoga goal will be (I don't think I'm ready for handstands yet!). So happy you are liking Kara's plan so far! I absolutely loved it when I used it and will most definitely be using it again. YAY for huge goals!!! Can't wait to see how 2017 plays out for ya! I try and follow the SMART goal formula, but lately my ambition to set goals hasn't been super high. Right now I feel like I have more dreams than goals, but for now I think that's okay. Hope your last day of work goes by quickly and you can enjoy your vacation! Thanks for the link to Kara's plan -- I am still deciding on my training plan for my next half. As I wrote about recently, while I'll train hard, I really try not to have time goals. I have an idea of where my fitness level is, and a time window I'll tell my husband, who is waiting for me, but so much goes into having a "good" time -- so much that is beyond our control -- it can really make you crazy. 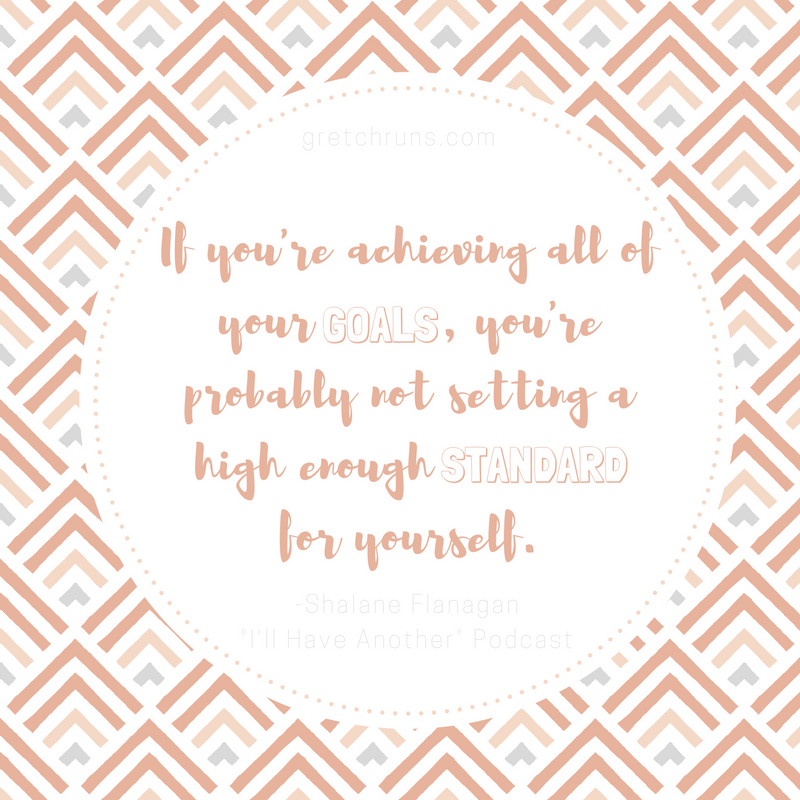 It's not that I think you shouldn't have time goals -- or aggressive ones, at that -- but you should have a lot of other goals, too. Especially for a marathon -- so much training goes into it and it can be so disappointing if you don't meet your goals. I think it's great that plans are out there to help runners train! YAY for you for sharing your upcoming goals, even if they scare ya! I just read over the Kara Goucher plan and am seriously in LOVE with it. Especially those speed workouts. Those sound so much more geared to a HM than ones that have me doing lots of 400 M repeats. I had already sort of morphed a few plans, but thinking now I may base the guts of my plan around hers & go from there. Probably add in one more day of cross training versus running, but that's just a me thing. Also, my eventual HM goal is to run a sub-145 as well, before I turn 30. Which would give me just over 3 years. Not totally unreasonable, but will take lots of hard work. My PR right now is a 1:54.01. You've got this! I feel like the Boston goal seems so unattainable to so many people (myself included) but when you take that hour and spread it out over 26+ miles it doesn't seem nearly as bad. You can totally get there and I think it's all about making those smaller goals as stepping stones. I think having goals is what keeps this sport interesting! I have already reached my running goals but instead of making new ones, i'd like to reach those goals again someday and start to be more consistent with them. Does that make sense? I always admire your goal setting and plans!! go and get them!! You totally got this!! I loved this post, specifically the mention that you should have "stretch" goals. Your goals sound awesome, girl! I don't think you should be scared of sharing them at all because I am sure you can achieve them! Glad to hear your sharing! It hopes that you will be able to get your goal. Good luck! I'm so excited for you Gretchen! It takes courage to publicly state your goals, but I don't think anyone would laugh at you for them! For as long as I've known you, you've worked hard and achieved so many goals, so I am 100% confident you will achieve these! Love the quote from Shalane! Sub-1:45 in the half is a goal I would like to hit (and eventually 1:42, just because that's a full hour off my first half time). I'd like to think I have a BQ in me eventually, but I'm just hoping to break 4 hours this spring and maybe then I'll starting thinking Boston! I totally agree with you though - why not try?! You never know!